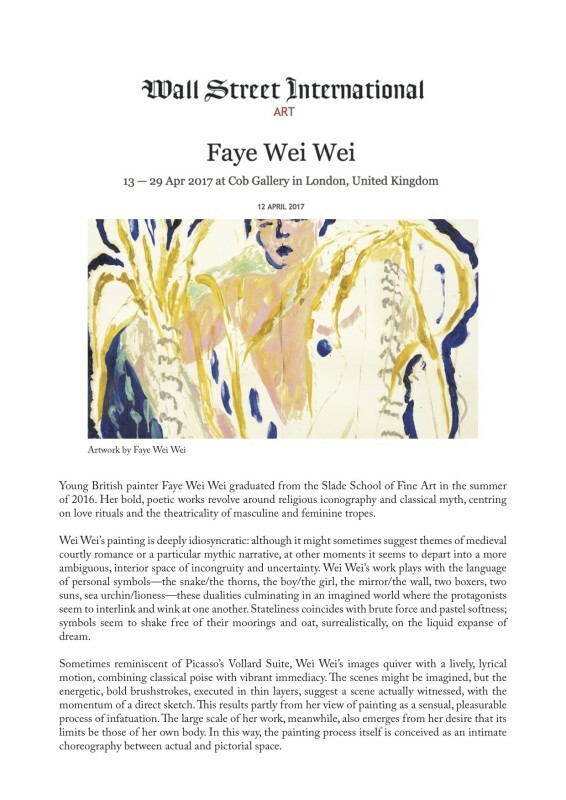 Young British painter Faye Wei Wei graduated from the Slade School of Fine Art in the summer of 2016. Her bold, poetic works revolve around religious iconography and classical myth, centring on love rituals and the theatricality of masculine and feminine tropes. Wei Wei’s painting is deeply idiosyncratic: although it might sometimes suggest themes of medieval courtly romance or a particular mythic narrative, at other moments it seems to depart into a more ambiguous, interior space of incongruity and uncertainty. Wei Wei’s work plays with the language of personal symbols—the snake/the thorns, the boy/the girl, the mirror/the wall, two boxers, two suns, sea urchin/lioness—these dualities culminating in an imagined world where the protagonists seem to interlink and wink at one another. Stateliness coincides with brute force and pastel softness; symbols seem to shake free of their moorings and oat, surrealistically, on the liquid expanse of dream.